Frustration was the emotion upper most in the thoughts of Edinburgh Capitals forward Ian Schultz following tonight’s 5-4 Forth derby defeat by Fife Flyers at Murrayfield. Edinburgh, who were blanked 4-0 at Manchester Storm on Saturday knocking Caps out of play-off contention with five games of the season remaining, came up just short against Fife in an old fashioned barnstormer of a game despite a thrilling third period comeback. With Fife already qualified for the post-season, this was a dead rubber, but thankfully it was played in the spirit a derby should be, Schultz with 21 minutes of penalties to his name, bleeding from a head wound sustained in a fight with Flyers’ Tommy Muir, and some swelling just below the left eye, most probably caused by an elbow to the face from Fife’s talisman Ryan Dingle, did not look a man who had nothing to play for. “I took a couple of penalties,” said Schultz. “It was frustration due to the lacklustre season we’ve had. We have a great group of guys here, and this is a good organisation; to underperform the way we have is frustrating from start to finish. As our season winds down that’s what we’re thinking about. You saw the emotion out there, and the fact that the guys care. We almost brought it back, it would have been a great win for the fans. Edinburgh have now failed to win on home ice in six games, a streak that would have been broken if Caps could have taken any of the numerous excellent early chances they created. Instead it was Fife who grabbed the only goal of the period, scored on the power-play through Carlo Finucci not long after Schultz and Muir’s scrap that broughtt the crowd to it’s feet at the 15 minute mark. The only highpoint for Capitals in a poor middle period came within a minute of the restart, Yevgeni Fyodorov firing in an equaliser after Flyers goalie Shane Owen did well to deny Pavel Vorobyev on a break-away seconds earlier. It was Fyodorov’s last meaningful contribution as he left the game following a puck to the face soon after. 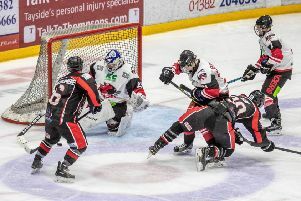 Edinburgh handed Flyers a second goal when Chase Shaber came out of the penalty box to find himself clean through on hung-out-to-dry Edinburgh goalie Travis Fullerton. It was a lovely backhand finish from Shaber, but a goal that was criminal to concede from an Edinburgh point of view. Flyers pulled further ahead in the 32nd minute, James Isaacs unchallenged from the slot after an excellent Matt Sisca pass. A clearly frustrated Edinburgh then ran into penalty trouble, Schultz already called for holding, added a ten minute misconduct to his misdemeanour after letting rip at match referee Steve Brown. Vorobyev made his own way to the penalty box soon after and Fife made Edinburgh pay, Dingle scoring on the five-on-three power-play opportunity at 34 minutes and 52 seconds. All in all a poor period for Edinburgh, although Caps were unlucky when a slap-shot from Michael D’Orazio hit the back of the net, coming out again so quickly it was missed by the goal judge. Schultz, who was involved in everything going on, scored an early third period goal for Edinburgh closesly followed by a deflected Mason Wilgosh effort pulling Edinburgh to within a goal with just under ten minutes left. Crucially Edinburgh lost momentum when Vorobyev was called for tripping just six seconds later and Kyle Haines, with another power-play goal, won the game for Fife despite a Michal Dobron slap-shot with three and half minutes left setting up a grandstand finish.